After about fifteen years of struggle, the communities in resistance located in the Jiguamiando and the Curvarado basins have obtained a judgment from the constitutional court ordering the restitution of their land, illegally occupied by megaplantations of African Palm. Since their first displacement in 1997 and the recognition of their collective property title in 2001, the communities of the Jiguamiando and Curvarado organized themselves into Humanitarian Zones and Biodiversity Zones and benefitted from both national and international accompaniment. The communities’ lawyers have succeeded in documenting the links between these « development » projects, financed by the Colombian Government and International Aid Programs, and the paramilitary structures still in place. The topic of African Palm in the Choco has become, after years of struggle, a national issue about the restitution of land to farming communities, whose resiedents have been the victims of paramilitary crimes. The government of President Santos, in an effort to distinguish itself from its predecessor (Uribe), maintains a discourse in favor of land restitution, but government actions speak the contrary. Despite the court order, the Palm plantations remain intact. On the ground, the discrepancy between government discourse and action is lived out every day by communities as land invasion, death threats, and criminalization. African Palm owners have framed prominent leaders of the minor Councils who live in the Humanitarian and Biodiversity Zones of the Curvarado and Jiguimiando as being members of the FARC-EP. This legal strategy, on the one hand, prevents the representatives from the communities from testifying against the Palm owners in court and, on the other hand, puts into doubt the leaders' right to the land. Since mid-April 2011, there has been a resurgence of paramilitary troops armed with AK-47s in these communities. Prior to this, since the so-called demobilization process of 2005, paramilitaries had maintained a more discreet presence, sporting civilian clothes, guns and radios. Since mid-December 2010, more than 200 hectares of the collective Curvarado territory are illegally occupied by invaders and protected by paramilitaries. These invaders are, generally speakig, farmers from other regions who are not involved in resistance processes and who are ready to accept « development » projects. The goal of their installation on the territory is to « return » the land to the communities that are open to negotiating with the industry. 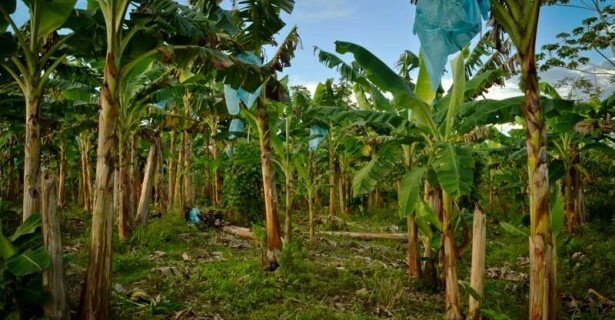 It is thought that representatives for the Banana companies are behind this renewed land occupation. While an eviction notice has been issued to the illegal occupants, no action has been taken because the Uraba regional police department claims it does not have enough employees to carry out the eviction. In 1997, under the pretext of FARC-EP guerrilla presence in the region, the department of Chocó underwent a series of military operations named ‘Operation Genesis’ under the command of General Rito Alejo del Rio Rojas of the 17th Brigade of the National Army. Simultaneously, while Army helicopters bombarded the region, paramilitary groups identified as AUC (United Self-defence of Colombia) invaded civilian villages. They ordered the people to leave their territory and committed massacres while they burned down houses and crops. Communities of the Jiguimiandó, Curvaradó and Cacarica river basins were among the hundreds of communities who were thus forced to flee their villages immediately with hardly the clothes on their backs. Today, almost 10 years later, the perpetrators of the crimes committed at the time of ‘Operation Genesis’ remain in complete impunity. Since their displacement, the communities were forced to live on the periphery of villages in inhumane conditions, crowded into temporary housing, dependent on frequently insufficient food aid. Unaware of eachother's existence, the Afro-Colombian and mestizo communities of Jiguamiandó and Cacarica progressively began to organize a return to their respective lands. By the end of 1999 and the beginning of 2000, in different stages, the communities were finally able to return to their ancestral lands. The communities of Jiguamiandó as well as Cacarica asserted themselves as populations engaging in civil resistance, reclaiming their rights to Life, Land, Self-determination, Freedom, Justice and Dignity. They developed mechanisms of protection enabling them to continue civil resistance amidst the armed conflict: the ´Humanitarian Zones´ were created, two situated in Cacarica and three in Jiguiamandó. Parts of the communities of Curvaradó, living in Jiguamiandó, have since created two new Humanitarian Zones on their territory (April and October 2006). The ‘Humanitarian Zones’ are physically delimited spaces where many communities have regrouped to live together. They serve to distinguish a civilian population living within an armed conflict, not to be confused with armed actors. They are opposed to the vicious exploitation of natural resources on their land and to the blood-stained development model imposed from above. The communities of Jiguamiandó, as those of Cacarica, seek to continue living freely on their land, practicing traditional subsistence agriculture. In the case of the communities in the Community Council of the Jiguamiandó River Basin and the 9 communities of Curvaradó, situated in the department of Chocó, there are currently 1500 hectares of African Palm sown illegally by the Urapalma Company on the communities´ collective territory to which they hold the legal collective title, under law 70 of 1993 which protects ancestral territory of Afro-Colombian communities. In the case of the CAVIDA communities in Cacarica, department of Chocó, the Maderas del Darien Corporation has been for many years illegally cutting immense quantities of high quality lumber on the collective territory of the communities. Paramilitaries are threatening to kill Afro-descendants in the Cacarica River Basin in north-western Colombia. There is an imminent threat of forced displacement. U.S. Representatives Henry “Hank” Johnson, James McGovern, George Miller, Sam Farr, Rosa DeLauro, Janice Schakowsky, and Barbara Lee sent a letter to Colombian president Juan Manuel Santos expressing concern over threats faced by Colombian land rights leaders. Chiquita Republic United Fruit’s heir has again been linked to paramilitary abuses in Colombia. Read more about Chiquita Republic United Fruit’s heir has again been linked to paramilitary abuses in Colombia. Careperro Mountain ("Haykatumá in the indigenous Embera language,) is one of the most sacred and important sites for the Embera culture. Beneath this mountain, lies gold, copper and other minerals. When the government awarded nine mining titles to the U.S. company Muriel Mining Corporation in 2005, for the purpose of extracting natural resources in the Chocó, the Embera communities were strongly opposed from the start. The Washington Office on Latin America visited Chocó in March 2012. Alarmed by the severity of grave human rights situation in Chocó, we support the following statement issued by Diocese of Quibdó. We also encourage the U.S. government to promptly act in order to guarantee human rights and territorial rights for Chocó’s Afro-Colombian and indigenous peoples and to promote efforts that dismantle the military, political and economic operations of illegal armed groups in the Chocó. If you ask people in the Curbaradó river valley how they are doing, they will often say: ‘Aquí, luchando’ (here, struggling). During the last several months I’ve been accompanying quite a bit in Curbaradó, and am beginning to understand why they say that. The Chocó has some of the richest land in Colombia. There is an abundance of water, minerals, and biodiversity. This has also meant significant potential for agricultural businesses. Since 1996, three thousand Afro-descendents and mixed race persons from the Curbaradó and Jiguamiandó River Basins have been displaced by paramilitary groups. About 10 years after being forcibly displaced, these people returned to their land. However, by then, the land was in the hands of others. In order to resist, they established humanitarian zones.